Take your paintings to the next level with these uniquely shaped painting knives. Use them with relief pastes, including mortar, matte and heavy gels, modeling pastes, and gesso. Experiment with creating "relief" effects in a variety of thicknesses and layers with acrylics and oils. These Italian-made knives feature water-resistant mirror blades made of hand-ground steel and handles crafted of high-quality bubinga wood. 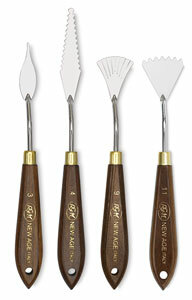 Set of 4 — This set includes one each of painting knives #3, #4, #9, and #11.